The Littlest Petshop isn't exactly the kind of show I'd be chomping at the bit to watch, but turns out it's not that bad of a show. 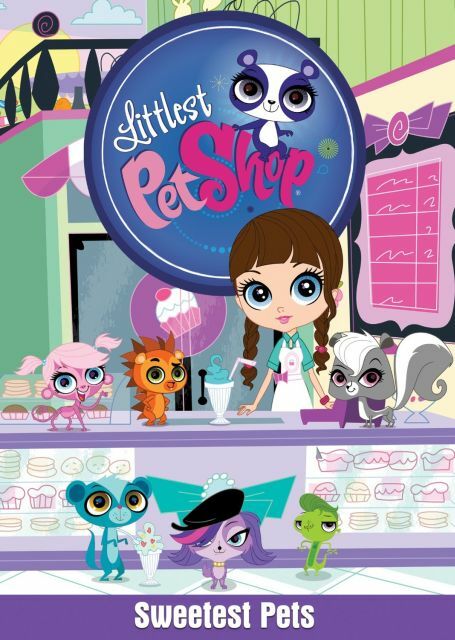 This DVD release contains 5 episodes from the middle of the first season so you don't really get the backstory but from what I gather a teenage girl named Bythe had moved to this new city with her father into an appartment above a store called The Littlest Pet Shop... and for some reason she has the ability to undestand and talk with the pets. So that's the basic setup. The art and animation are pretty simple, and almost look like it was made with Flash, but it's good enough. All the characters have super large heads with giant eyes, and these really help to convey emotions as well as add a unique style to make it stand out. The color palette is nice and bright and visually pleasant to watch. The comedy in the show really isn't bad for what's obviously a childrens' show, but while some cartoons work on multiple leavels for both kids and adults, this really isn't one of them. The plots are pretty simple and try to teach kids life lessons, which is great for a kids show. The first episodes on the disc is called Topped With Buttercream, and in it Blythe's friend's aunt opens a store next to The Littlest Pet Shop that sells candy and sweets. The pets happen to discover a hole in the wall between the two stores and wind up sneaking over to eat a bunch of sweets, and the sugar turns them all crazy, like Lord of the Flies. It's actually pretty funny to watch them turning on each other with candy, and they introduce a fast-talking twitchy little bunny character that isn't part of the regular Pet Shop gang. Oh, I supposed I should introduce the regular pets... there's a diva-like pink-purple Spaniel named Zoe who loves to sing, an adorable purple and white panda named Penny Ling who is quite shy, a pink artist monkey named Minka who loves to pain, a grey and white comedian skunk named Pepper, a very serious and organized hedgehog named Russell, a blue mongoose who fancies himself a magician named Sunil, and a green gecko named Vinnie who enjoys dancing and isn't very bright. Each character has both a unique personality and a unique talent or interest which means there's a good chance no matter who you are you'll have someone to identify with. So the show really isn't half bad for a kids' show; I enjoyed watching all five episodes on the DVD though I'm not sure I'd want to binge-watch an entire season. Better to space it out a bit, otherwise you may experience a cuteness overload! Episode 18: What's In The Batter?